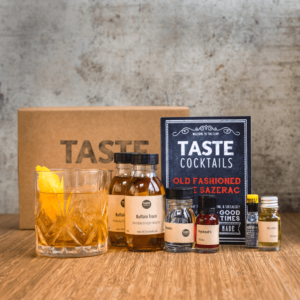 TASTE wants to help you make bar-quality cocktails at home! We sell a range of cocktail kits and equipment to help you discover new ingredients and recipes, and find your new favourites. We go into detail about the history of your drinks and the story of the people who created them in booklets in the box, and our online magazine. 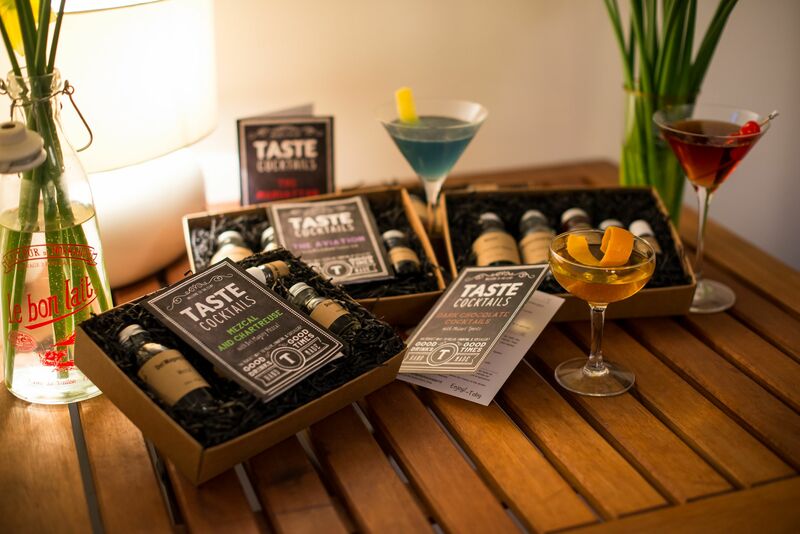 Each box contains premium ingredients and recipes to make 5-6 cocktails (with a little extra to taste), and information about the source and history of your drinks. We offer gift subscriptions too where the receipient will receive a different kit every month. When it arrives you’ll have the ingredients to mix incredible cocktails and the information to improve your technique, knowledge and enthusiasm for the world of mixology. Our ingredients and recipes are selected in consultation with the UK’s best and most experienced bartenders and spirits experts, and our team are all cocktail fanatics in their own right. What’s in a TASTE kit? The recipe booklet in each box also contains articles about the source and history of the ingredients, interviews with industry experts and hints and tips for improving your technique and tasting. Our online magazine offers even more alternative recipes to help you discover a cocktail that you really love. What about shakers and equipment? We also sell equipment kits to make sure you have everything you need to start making cocktails straight away. 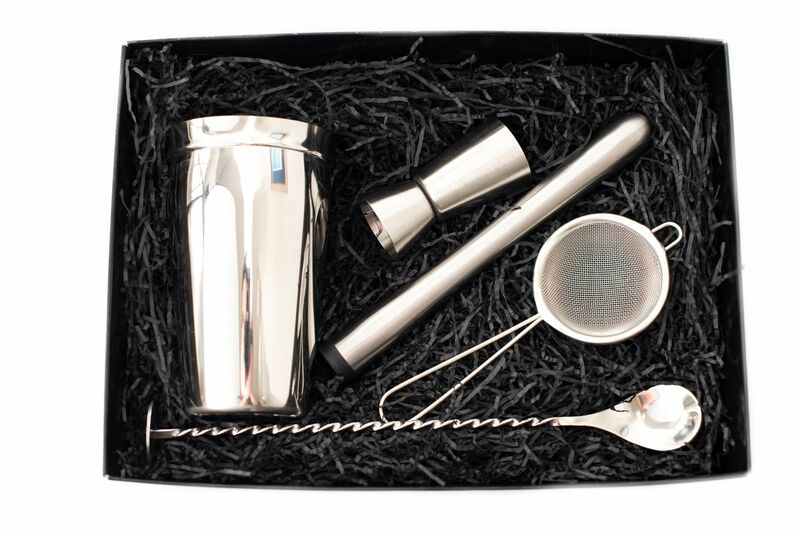 The Mixologist Kit contains a shaker, jigger (measure) and a bar spoon, plus a muddler for smashing the flavour out of your ingredients, and a double-strainer for getting those martinis perfectly clear. Get your first cocktail kit now! Please place orders by midday on Tuesday 18th for delivery by Christmas. Note: Our packages are sent by Royal Mail 2nd Class service & do not fit through the letter box. For orders after this date we cannot guarantee delivery before January. We are completely offline for customer service questions from 21st December to 4th January. How many drinks can each kit make? Each kit makes 5-6 cocktails (sometimes more!) and often you’ll have some left over to taste ingredients on their own or to experiment with. The only exception is the Manhattan Kit, which makes 4 dirnks with full measures, but you can reduce the quantities to try more different recipes. We always recommend you to use standard measures of 20ml rather than the usual 25ml in order to taste as many different cocktails as possible! When do you send the kits out? We send out all of the subscription kits once per month, the date will vary slightly but generally it is at the end of the month, so the kits arrive in the first week of each month. Single kits are usually sent within 5-7 days of your order, but if you need a kit by a certain date, get in touch. How will I know how to make the drinks? Each cocktail kit comes with a detailed recipe card which will take you through a step by step of how to make each cocktail. You can then choose which to make and taste. Our online magazine offers alternative recipes, and tips on technique, the history of the drinks, and the story of the people who make the ingredients. You’ll also be able to watch our founder Toby make the featured drinks on our YouTube channel. What happens if I don’t like the cocktail? We make sure there are a variety of cocktails you can make with each box meaning if you’re not too keen on one you can make another, we often include a short and long cocktail recipe as well as a sweeter version, and other alternatives in our online magazine. If you think you won’t like a subscriber kit before it arrives, let us know and we can try to replace it for you with a different one. However, we often find that our customers think they don’t like a particular spirit, and after trying some of our recipes they change their minds! Can I give a kit as a gift? Of course, people love receiving a subscription or a one-off kit as a gift. You can simply order yours with the address of the recipient and we’ll deliver it straight to them (we don’t put any invoice in with the box), and we can add in a free gift message for you, and gift-wrap any kit for an extra £3.50. You can also buy vouchers for a last minute gift, delivered by post or email. What do I need to make the cocktails? You can make all of the cocktails using the items you’ll find in your kitchen such as glasses, spoons, etc however we also offer an equipment kit which will help you make the best cocktails. The kit includes all the main liquid ingredients you’ll need, but sometimes you’ll need to buy extras such as citrus fruit, soda water, and ice. We list these extra items you might need to buy on the product page. If you wish to to cancel your monthly subscription (no longer available to buy, but some customers are still subscribed) you can do so whenever you like, simply by e-mailing info – at – tastecocktails.com. If you paid up-front for a 3, 6 or 12-month subscription, or bought a gift voucher, we usually aren’t able to cancel or refund these part-way through, but feel free to get in touch and we’ll see if we can help. Can I buy equipment from TASTE? Yes, we sell everything you’ll need in our Mixologist Equipment kit. A shaker, bar spoor, muddler, strainer and jigger (measure). You can get away without these tools and still make great drinks from our ingredients kits using standard kitchen tools, but we think it’s far more fun to do things properly! My kit didn’t arrive, arrived broken, or without an ingredient. What can I do? So sorry to hear that! Our posties are usually excellent, but sometimes accidents do happen. If possible, please send us a photograph of the damage and we’ll replace the broken bottles, or send a whole new kit if it’s necessary. There may be a short delay while we ensure we can claim compensation from the courier. If your kit doesn’t arrive at all, and it can’t be found at your local Royal Mail sorting depot, we’ll attempt to re-deliver it, or send you a new one. Get in touch and we’ll first try to track the parcel before arranging a replacement. Get in touch on team – at – tastecocktails.com or through our contact page. I represent a bar, distributor, or spirits brand. Could you feature it in a kit? Since we’re an independent company, we’re free to hand-pick the best quality ingredients from wherever we find them, so if your brands have an interesting story, and make great drinks, we’d love to try it out! Get in touch to send us a sample and we can tell you more about the promotion we offer our featured brands. The best way to promote a new ingredient is to work with us to create a new cocktail kit! If you have an spirit or liqueur, and some great recommended cocktail recipes, let us know! We’d love to work with bars and bartenders too. If you have a great recipe to get out to the world, or perhaps would like us to feature you or your bar in our magazine, just get in touch.